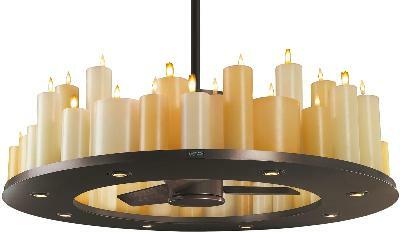 Ran across this chandelier/ceiling fan unit online. If I buy one, which of you will volunteer to keep it dusted for me? I seriously considered getting the one below because it's so unique. The unit holding the 2 fans slowly rotates, taking 20 seconds to make one revolution, so I guess it gives kind of an oscillating fan effect. But on investigation I found that it's much smaller than I imagined. The whole span of the thing is just 3-1/2 feet and the diameter of the two fans is only about 12". It would be awesome, if it was about twice that size! I like the look but a bear to clean! That would be worse to clean then the candle one....sorry I don't like this look. Yes, it has a commercial look like might have been in a building of mine's era. The description says it's patterned on a fan made in 1905, which is only a few years after my building was built. But as I mentioned, it's half the size it ought to be! Could be employed, but a ceiling fan works pretty well too. I'll pass on that one. Been seeing a lot of "interesting" ceiling fans in the stores now....not my cup of tea. I love the one that looks like a vintage airplane propeller! What do you think the high setting is for? how high up will it be? There is a long one of these at a restaurant in town and that's the first thing I thought when I saw it! How the heck will they dust it!